These days, developers of sectional title schemes generally opt for open underground parking, as opposed to the individual ground level garages of days gone by.For owners in older blocks, garage door maintenance is a reality and should be included on their annual to-do list. Garage doors get a lot more use than most unit owners realise. The garage door of a unit owned by a family can be opened and closed up to 20 times per day. That’s a lot of opening and closing every year! Garage doors will eventually fail if they are not maintained. A faulty garage door is usually just an inconvenience, but it can potentially cause damage to the owner’s vehicle or home and even injure a family member. Consequently, it is important to perform garage door maintenance at least twice a year. There are several different types of garage doors available. In this article, we provide general advice for all types of doors, with a few specific considerations and cautions for the older (and previously most popular) “canopy” doors. The first step in garage door maintenance is to examine the tracks and make sure the sections that are bolted together are flush with each other. Frequently, a bolt that holds the tracks together will loosen. If this happens, the tracks may become slightly skewed, or the loose bolt may protrude into the track area, causing the door rollers to occasionally catch on it. This can cause added torque on the garage door opener, which may trigger it to reverse direction. If this is the case, simply tighten up any loose track bolts and make sure the track sections are flush. It is a good idea to oil the garage door tracks with motor oil. Use a rag and simply wipe them down. When examining the garage door tracks, use a spirit level to make sure they are level. They should be fastened to the garage door opening such that they are parallel with it. If they are not, adjust them appropriately. Every six months, take a look at the hardware parts that make up the garage door. Look for worn metal, loose connections, and anything else unusual. If you spot anything, call a professional. Probably the most important parts of a garage door are the springs. These beasts are the muscles that are supposed to do 95% of the work to lift an overhead garage door. If you have to struggle to lift your door, then the springs are out of adjustment or possibly worn out. If the door is well lubricated and is not in a bind within the tracks, it should stay suspended in a halfway open position. If it opens, the springs might be too tight. If the door closes on its own and slams to the ground, the springs are too loose or worn out. Every year, home owners get seriously injured when they fiddle around with garage door hardware. Remember: when a garage door is down in the closed position, the springs are like cocked guns. If you unbolt a nut and the spring rips the bracket from the door, it can cause serious injury. It is also a good idea to wipe down the springs with a little motor oil to make sure they do not catch when opening or closing the garage door. Check the base of the garage door to make sure there is no rust or decay. Also check the weather stripping to see if it is damaged. If it does not need replacing, just wipe it down with a vinyl cleaner to protect it from UV damage and keep it flexible and pliable. With these few garage door maintenance tips, your garage doors should continue to operate smoothly for months to come. Rob Paddock is the operations director for Paddocks. 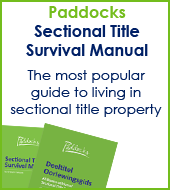 For free sectional title advice go to www.sto.co.za. Who is resiposible for the maintenance?